We are sold out of queens at the moment. The swarm season has started. Strong over wintered colonies are the most susceptible to swarming. A package can swarm if the hive gets crowded. Most of the field bees, the honey collectors, leave with the swarm. A look in the hive may look like nothing has happened because there still will be a large amount of bees in the hive. When a beekeeper looks in the hive during the day most of the field bees are out foraging and are not in the hive. So that is why it doesn't look like nothing has changed. Usually the hive when it swarms, will make very little excess honey. Starting in late May, a overwintered hive should be inspected every 7 days to look for swarm cells. The swarm cells should be cut out before they are capped. Normally when swarm cells are capped, the bees swarm at this time. Swarm cells, usually on the bottom of a frame, but can be in other locations. Strong over wintered colonies should be divided or the bees will divide themselves with a swarm. When beekeeper looks in their hive and sees capped swarm cells. Normally there will be no eggs or small larvae on any frames. This is an indicator that the hive has swarmed. Or if the beekeeper looks in the colony and sees very little brood and really can't find swarm cells, the first impulse is to purchase a new queen. The hive could have swarmed. Sometimes the bees tear down the swarm cells and leaves a beekeeper unsure of what has happened. If a new queen is put into the hive and there is a queen in the hive already, the new queen will be killed by the newly hatched queen. Everyone who purchased bees from Nature's Nectar LLC on our April 11th and April 18th deliveries should be in their second box by now. If the bees have been stubborn and not drawn out the outer frames in the first box, but their population clearly has gotten bigger. I would put on the second box any way. Move a frame they are working with nectar and pollen in the frame, from the first box. up into the second box. As the bees draw frames in the second box, I would exchange the lower undrawn frames with drawn frames and slide drawn frames with no brood on them to the lower box. When the comb is all drawn out in a box you remove one frame and run nine frames in each deep box. If the bees are on new foundation the hive still needs to be fed sugar syrup until the bees have finished making comb on all the frames. The population in the hives should now be increasing rapidly. Brood will be emerging now daily. With the larger population the bees should be able to make comb faster and may use the sugar syrup at a little faster rate. The dandelion and fruit blooms are for the most part over with. Right now there is very little nectar out there for the bees to get. The next nectar flow will be Black Locust trees. They should start blooming soon. Hives with large populations may be able to get some honey from this blooming tree if the trees are in the hives foraging range. 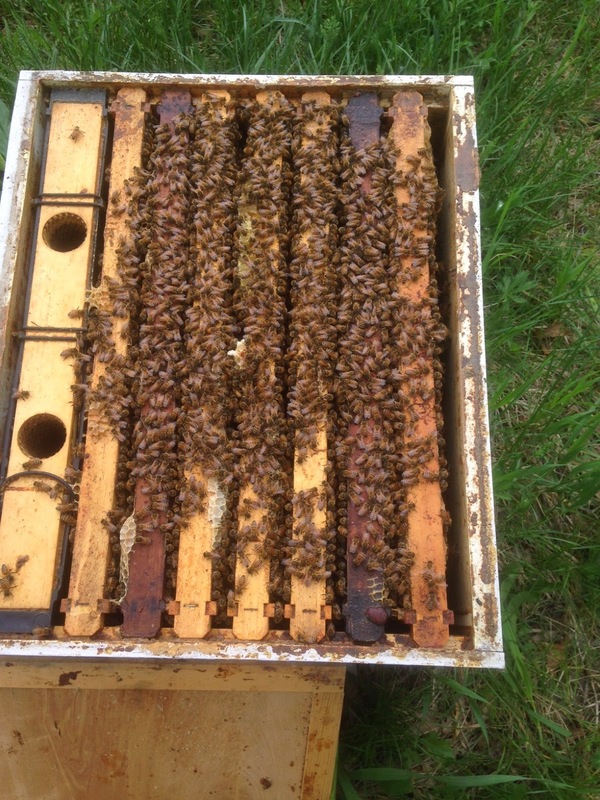 Make sure honey supers are on all overwintered colonies. Upcoming nectar flows: Alfalfa will be available around the first week of June with the first cutting of hay. Alfalfa usually produces more nectar with the second cutting of hay. That usually happens in early July. The main nectar flow in the Twin Cities usually begins around the third week of June. Earlier in southern Minnesota later in the northern part of the state. When a new hive has finished drawing out their comb, a reversal is done. Bottom box is moved to the top. Then supers are put on at this time. When it is time to do this reversal and you find that the top box is very full and heavy with honey. It will be too late to do the reversal and the hive should be left the way it is and supers added. Out of Queens until Wed.
We are sold out of queens. There will be Carniolan's and Italian's marked and unmarked. Big news from Brewmaster Nic Grau at Maple Island Brewery, 225 Main St N, in Stillwater, MN. He has brewed a firkin (10 gallons) of Kolsch (a white German beer) with crushed rose hips and a pound of wildflower honey from Betsy, as well as a full 250 gallon batch of ESB - now known as "ESB-hive" with 60 pounds of honey from Jim and Wendy at Nature's Nectar. The firkin is about half gone as of 5/20/15 with great customer reviews. The ESB-hive is conditioning in the fermenter and will be available soon. Check the Maple Island website for its release date. No growlers of the Kolsch because it's a small batch, but consider sipping some honey infused local beers from Nic at Maple Island while you enjoy springtime along the St. Croix! This last remnants of early spring is on its way out. The cold weather may have affected your colony. In the warm days preceding the cold snap the bees had expanded their brood area in the hive. Eggs and brood are becoming widespread. Most beekeepers should have their second boxes on by now. The cold may have caused the bees to go into a tighter cluster. This may have pulled them off some of the brood. It would not be surprising to see the bees in the up coming days hauling dead brood out of the hive. 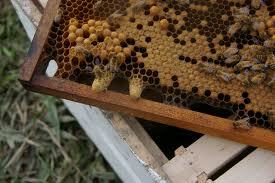 Or if you see some dying larvae in your hive it is not a disease. It is chilled brood. Chilled brood happens when the bees can't cover all of their brood in cold conditions. It also happens when beekeepers in early spring doing hive inspections, put their brood boxes on end instead of parallel with the ground. A cold breeze can whistle through the box and chill the brood in the frames. Keeping the box parallel with the ground helps prevent this from happening. Chilled brood can set a colony back a little but the bees will recover soon. We will be closed Friday May 22nd and Saturday May 23rd. Please plan ahead if you need something. I looked at my 2 lb packages of bees today. Most of them looked great. I hived the package on drawn comb. The bees are now covering 6 to 7 frames. They really needed a second box, but with the upcoming cold weather I decided to put the new boxes on Thursday or Friday, when it can warm up a little more. I fed every hive and gave them fresh pollen. Most of the patties were almost gone. The cool upcoming week will lead to very little foraging so most colonies will be using their stores of pollen. Having a pollen patty on will cover any extra needed pollen. The 2 lb package hives are packed with bees. I use a cap and ladder feeder on some hives that I move around to new locations. I looked at a few overwintered colonies. I did find one colony queenless with no brood. What I tell beekeepers, if you find a colony with no brood and you have other colonies. The first thing you do is put in a frame of brood. This prevents a colony from turning into laying workers. I then went and got a queen and installed her. The presence of brood actually helps queen acceptance. I put the new queen right next to the brood. I will check it in a week. 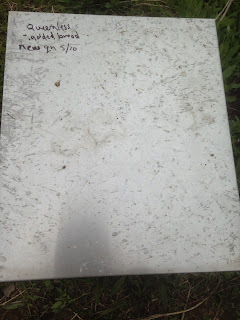 The one thing I do when running all my hives is I write down on the telescoping cover what I have to do to a hive. I use a black sharpie. This reminds me what I had going on. The sharpie marking always fades away by the start of the next season. This hive was queenless, added brood, new queen. Writing with bee gloves on, leads to poor penmanship. I still have a full cover to work with, as the season progresses. I do tell beekeepers to keep pollen patties on until June for a couple reasons. If the weather turns cold and rainy the bees will still be able to have pollen available to feed their brood. 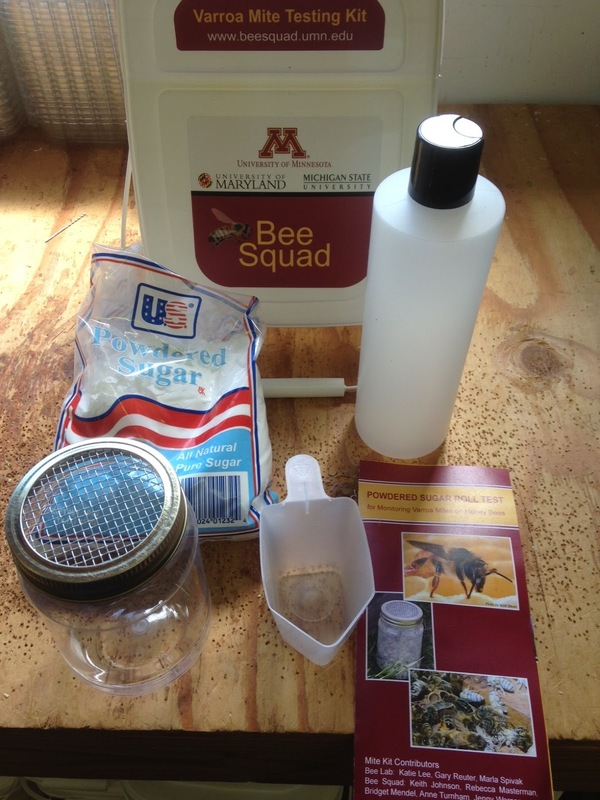 A package starts with around 5000 - 2 lb or 7500 - 3 lb bees. The queen starts laying in about 5 - 7 days. New brood goes through their life cycle that take 21 days for the first bees to hatch out. It is another 22 days before the new bees can fly. So that is about 50 days before the new bees can start collecting pollen. 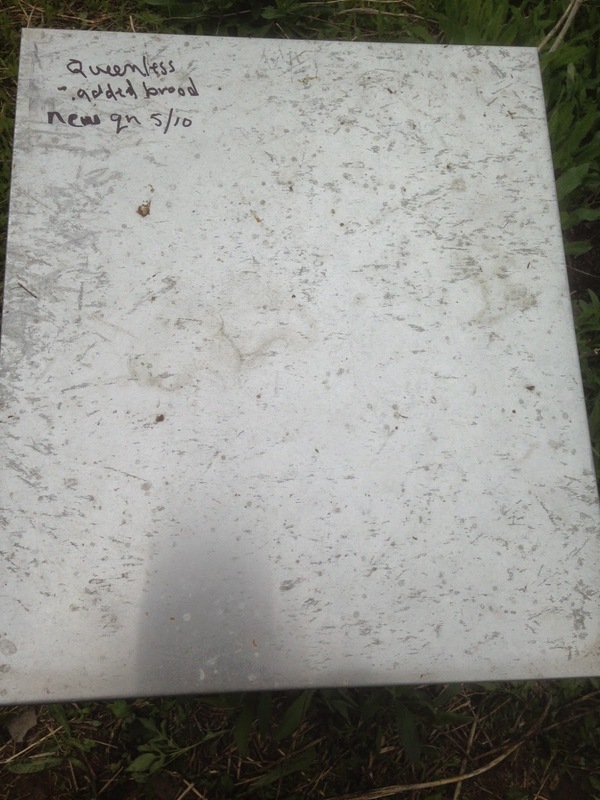 That puts us at around June 1st to June 7 before the new bees can forage. There is a growing numbers of bees in the hive but no foragers. Pollen patties need to be available at this crucial time of hive expansion. The bees that came in the package, their numbers are dropping everyday as they are getting older. The numbers of foragers will be dropping before new foragers take their place. The fruit bloom going on right now, gives the hive an opportunity to large amounts of high quality pollen. The fruit bloom starts to wane around the third week of May. From the end of the fruit bloom until around June 10th or so there is a dearth of pollen. Pollen patties helps the hive keep expanding. Sometimes the bees devour them, sometimes they go undisturbed. Keeping pollen patties on is cheap insurance that the hive is kept moving forward and expanding as the honey flow starts around June 15th to 20th. First delivery - Second Box? Beekeepers who put their bees in on or around April 11th should be very close to adding their second box. When the bees have drawn out or working on 8 of the 10 frames in the box, it is time to add a second box. 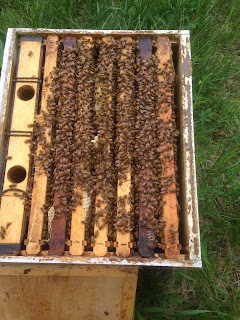 A frame that the bees are working on, with nectar and pollen in the frame, not brood, is moved from the first box and placed into the center of second box. This frame is bait for the bees to move up. There now are 9 frames in the first box. Evenly space them out and run 9 frames in the bottom box. If the bees have not drawn out 8 frames yet. Sometimes the bees will not expand their comb building without a little help. When inspecting the hive, start pulling frames from outside frames and moving towards the middle frames. The first frame that you come to, the bees may be working on one side and not the other. There will mostly be nectar and pollen on this frame. Turn this frame around and put it back where the frame was. The bees will start working on the new side. Do this on both sides of the hive. The next week if the bees are working on both side of that frame and have not moved to the next outside frame, you move the frame of nectar and pollen out one frame and put a new frame into the place that the nectar and pollen frame was. This helps the bees expand their brood nest. When the second box is added, the entrance reducer is increased to the bigger opening. Remember if you are drawing new foundation, you need to feed syrup until mid June. If you are not feeding, the bees will not expand their brood area and the population of the hive will suffer. The queens have arrived and will be available starting at noon. I will have queens on Thursday. They will be all Italian. There will be no Carniolan queens available until around the 20th of May. An Italian queen can be put into a Carniolan hive with out any problems. I talked to Ray my bee supplier. He says they have been having high winds for a couple weeks. This caused many queens not to make it back to their mating nucs. All of the queen breeders in California have suffered with this late windy conditions, that only recently has hampered queen production. The weather has gotten better and he did put out 4,000 Carniolan queen cells more than a week ago. The queens should be ready to be caged around the 20th.